Turkey: Fresh, organic 21.5 pound turkey from Grateful Harvest, ordered through the Sierra Vista Food Co-op. It cost a bit more than what I normally spend, but I think it was worth it. It tasted amazing! Although, I did use my “cheat” this year again, using a Reynolds Oven Bag, to cook the turkey. I added cut up onion, celery, and carrots to the bag, rubbed the turkey in olive oil and poultry seasoning. Sometimes, I think simpler is better! The broth the collected in the bottom I kept for gravy. Now, the turkey carcass is split up between my 2 slow cookers with new onions, celery, and carrots, plus water, to make turkey stock. I’m going to have a lot of turkey stock, which is good since I haven’t made chicken stock in a while. Dinner rolls: Ordered in my Custom FarmBox from Sunizona Family Farms bakery. We love their sprouted Khorasan bread, and these are made with the same sprouted Khorasan wheat. Delicious! Mashed potatoes: Red potatoes from Sunizona Family Farms, 2 pounds. Left the skins on, diced, and cooked until soft. Mashed and mixed in a stick of butter, 1/2 cup milk, and 1 tablespoon fresh chives, also from Sunizona Family Farms. Wild Rice & Sausage Dressing: Recipe here. Used Lundberg’s wild rice blend, then celery and onion from Bountiful Basktets and fresh parsley from Sunizona Family Farms. Bread & Celery Dressing: Recipe here. This year, I used Special Spelt bread from the Sunizona Family Farms bakery, and celery and onion from Bountiful Baskets. Green Bean Casserole: Recipe here. I used fresh green beans from Sunizona Family Farms to make it. I really like this, but I really want to find an alternative to using cream of mushroom soup in a can. I’ll be experimenting over the year to see what I can come up with. Cranberry Sauce: I used cranberries and oranges from Bountiful Baskets to make this. This was a lot easier than I thought! Here is how to make it. Dissolve sugar in orange juice over medium heat. Add cranberries, and cook until cranberry skins have cracked and a gel starts to form, about 15-20 minutes. 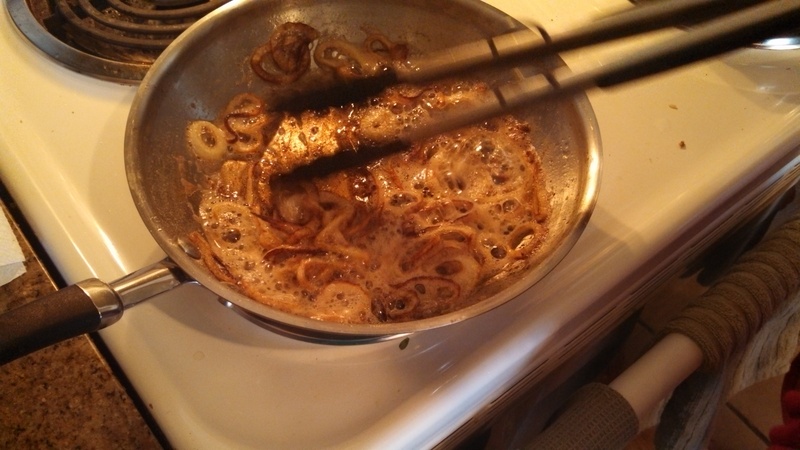 Pour into serving bowl and sauce will set more as it cools. 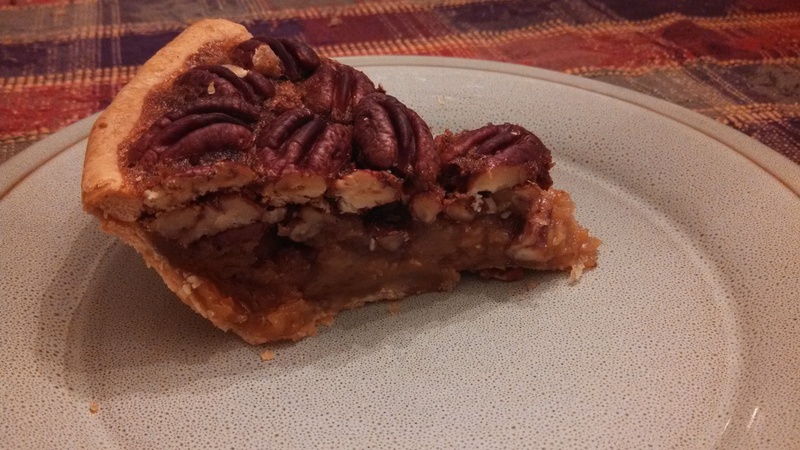 Sweet Potato Pie (not pictured): Recipe here. I used sweet potatoes from Sunizona Family Farms. 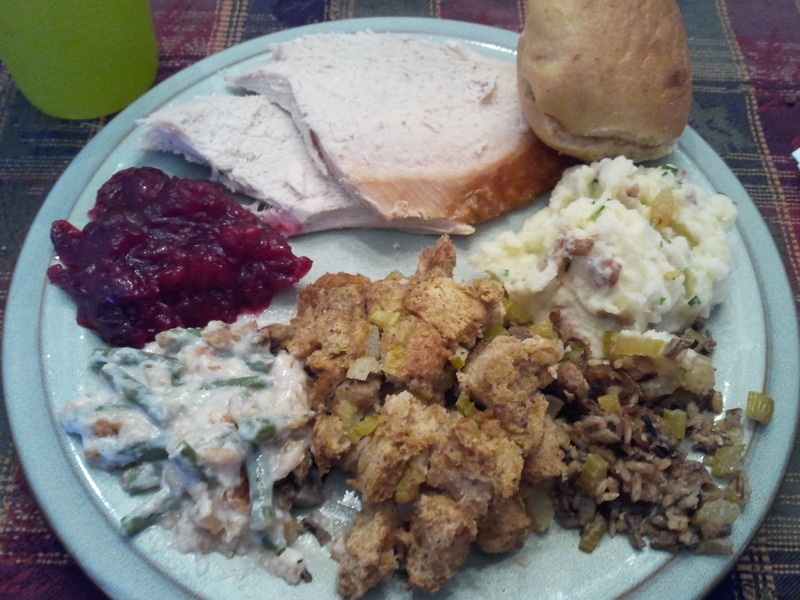 It really turned out to be a great meal that my family and I all really enjoyed! I hope that everyone else had a great Thanksgiving day as well! Time to thaw those Thanksgiving turkeys!! Thanksgiving is this Thursday, and if you are cooking a turkey, it’s probably time to start thawing it in the fridge, if that’s the method you choose. There have been a couple of years where I almost forgot to start thawing it out, or started it too late, so at the end, I had to put it in cold water to thaw it the rest of the way. The USDA Food Safety and Inspection Service has a fact sheet on safely making your turkey for the holiday, including guidelines on thawing and roasting your turkey. I ordered a fresh turkey this year, so I get to skip the thawing process! In addition to turkey, we will also be having mashed potatoes, bread and celery dressing, wild rice and sausage dressing, green bean casserole, dinner rolls, and sweet potato pie. The potatoes, green beans, dinner rolls, and sweet potatoes are all from Sunizona Family Farms, the celery and bread from Bountiful Baskets, and the turkey I ordered through the Sierra Vista Food Co-op. 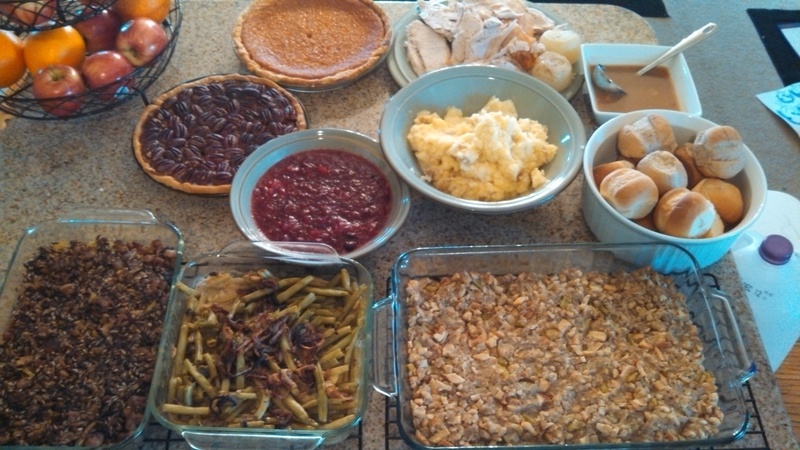 I am so ready to cook and eat it all! What will you be cooking and/or eating this week? 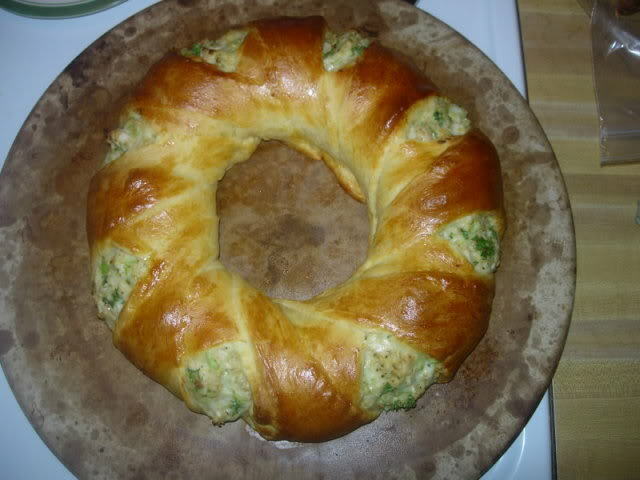 I guess I should really call this just a Turkey Wreath since I don’t normally add in cranberry. I saw this demonstrated at a Pampered Chef party, and I believe it is from one of their cookbooks. 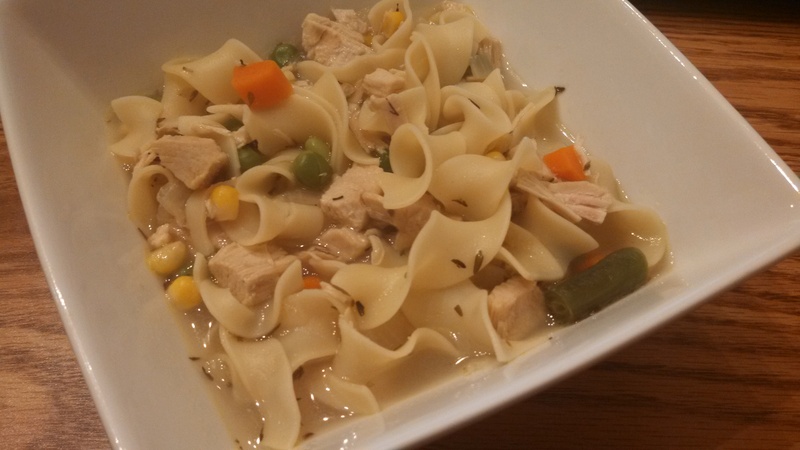 This is perfect to make with leftover turkey from Thanksgiving, but I didn’t get to make it this year because I used my leftovers in other ways. This would also be good with chicken in place of the turkey. The pictures I have are from when I first made it 3 years ago so that I would remember how to make it the next time. Unfortunately, I thought to take the pictures a little too late, but it at least helps some visually. In a medium bowl, mix together turkey, celery, cranberries, cheese, walnuts, mayonnaise, mustard, black pepper and parsley. Scoop filling over seams of dough, forming a circle. 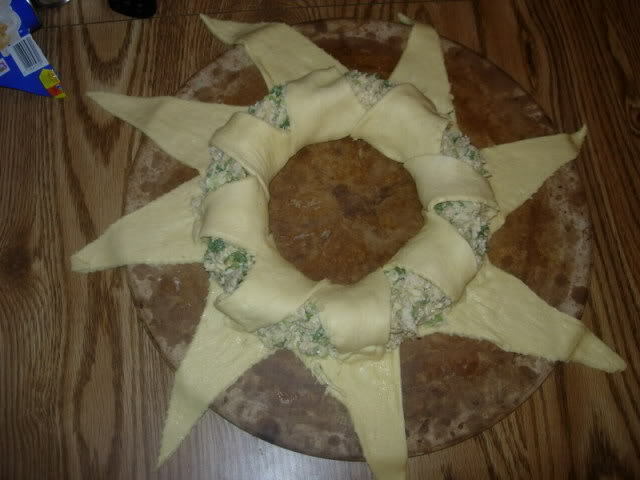 Separate crescent roll dough into 16 triangles. Arrange 8 triangles in a circle with wide ends of triangles toward the center on a large round baking stone. The corners of wide ends should overlap and points will extend 1 inch beyond baking stone. Arrange the remaining 8 triangles in center, matching the wide ends together. Seal the wide end seams using a roller. The points of these 8 triangles will overlap in the center, do not seal them together. 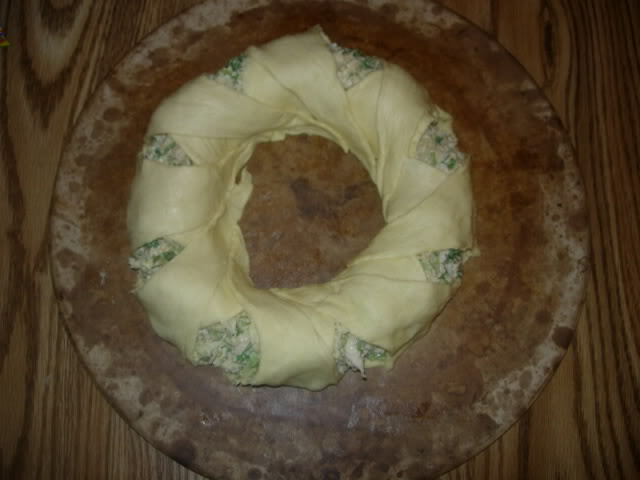 Lift the inner dough triangles across the filling and tuck under other side of filling. They should go over on a diagonal, however, in my picture below, they look folded straight over. Continue with the outer triangles, lifting them over the filling and at the opposite diagonal direction from the inner triangles. Beat egg white of the separated egg lightly; brush over dough. Discard the yoke. Bake 25-30 minutes or until golden brown. Cut and serve. I’m finally getting around to finishing off all the sweet potatoes I had accumulated from Bountiful Baskets. I wasn’t going to frost it, but since I had everything on hand to make cream cheese frosting, I went ahead and made it. Funny story about making frosting, growing up, I only thought it came in a tubs at the store, I had no idea you could make it. So, the first time my mom made frosting, I was totally impressed. Silly, I know. This frosting recipe will make more than you need for the cake, so store the leftover in the refrigerator until you have another use for it. 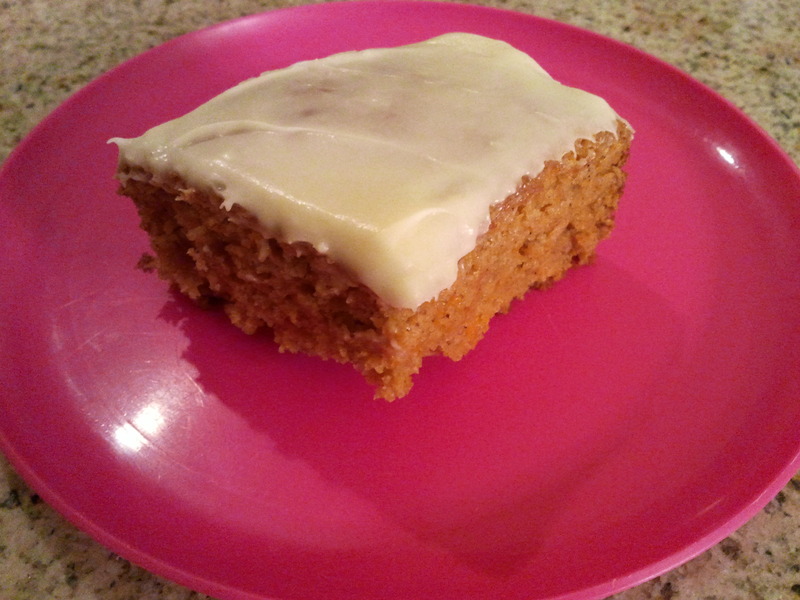 This cake turned out very moist and tasty, my daughter had no idea it was made from sweet potatoes. This would be go to make with the leftover sweet potato dishes from the holidays, you will just want to decrease the sugar in the cake if you had sugar in your sweet potato dish. 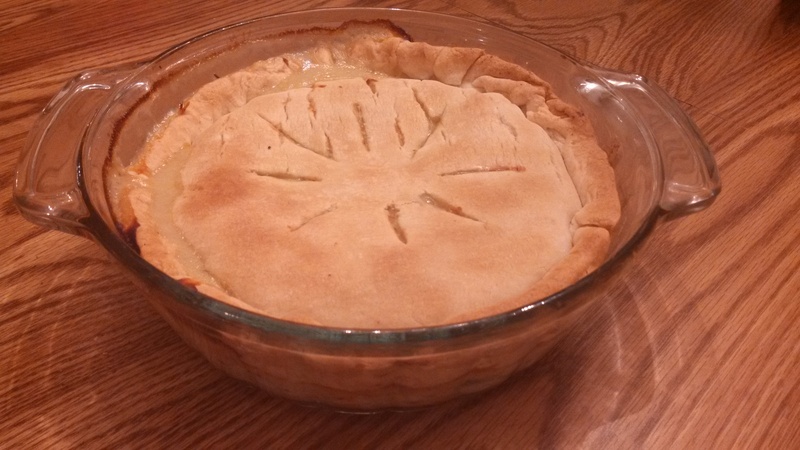 Preheat oven to 350 F. Grease and flour a 9×13 inch baking pan. Stir together the sugar and vegetable oil (or applesauce) in a large bowl until smooth. Beat in the eggs one at a time, then stir in the vanilla and sweet potatoes. In a separate bowl, combine the flour, baking powder, baking soda, salt and cinnamon. Stir flour mixture into the batter 1 cup at a time, alternating with the beer just until everything comes together. Spread the batter evenly in the prepared pan. 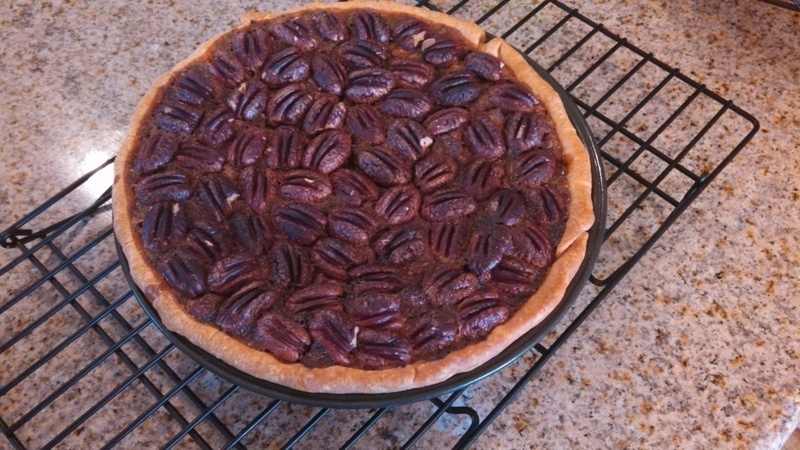 Bake for 35 minutes in the preheated oven, or until a knife inserted into the center of the cake comes out clean. Cool completely before frosting or serving. Beat together the butter and cream cheese. Stir in vanilla. Stir in confectioner’s sugar, starting with 2 cups. Increase amount of sugar up to 4 cups, depending on how sweet you want frosting. Spread evenly on cake.